Amy Chaloupka has a longstanding fascination with the visual language of maps. 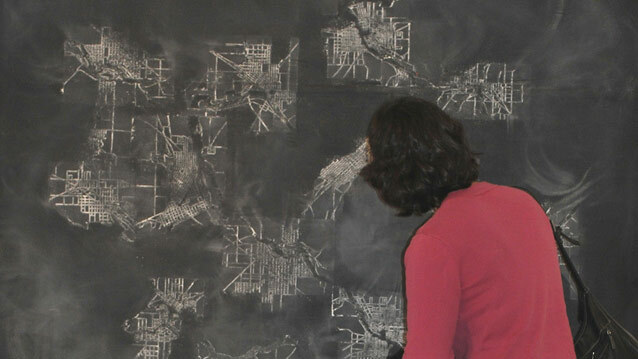 In her work as an artist, she alters existing maps, cutting and stretching them into transformed landscapes, and creates maps of imaginary terrains in response to the architecture of a particular space. Her current work is inspired by the rough, incomplete, and sometimes entirely fabricated information found in early navigation and plat maps. Chaloupka's re-ordered geographies function as poetic, open-ended queries about the way maps can be read or misread, and the impact they have on our sense of space and direction. For her installation in the James Watrous gallery, Chaloupka created work inspired by a group of maps she studied in the American Geographical Society Library at the University of Wisconsin-Milwaukee, and the exhibition included several historic maps borrowed AGS Library. Chaloupka, an assistant curator at the John Michael Kohler Arts Center in Sheboygan and an adjunct professor of art at Lawrence University in Appleton, resides in Adell, Wisconsin. She received her M.A. and M.F.A. in sculpture from the University of Wisconsin-Madison.